Near the Dove Mountain neighborhood in Marana, Arizona, lies one of the most favored hiking trails in the Tucson area. Wild Burro Trail offers spectacular views from every angle, and there are a number of hiking options you can choose, depending on your desired level of difficulty and length of hike. Wild Burro Trail begins just beyond the Ritz-Carlton’s parking lot. You don’t have to be a guest there; simply pass through the hotel gate, where you’ll be directed to a dirt parking lot. Be sure to grab a map if the hotel parking attendants are onsite, as it will be helpful in planning your journey. The beginning elevation is 2,800 feet. Once you’ve got a couple of miles on the very easy coarse sand trail, you’ll have the option to branch off to other routes. An old, ruined stone farmer’s house will be your mark once you’ve walked about two miles. At this point, the trail becomes steeper, but it quickly lends its way to a canyon overlook with a nice shaded area where you can catch your breath, set up a picnic, and enjoy the scenery. Although a map is always recommended for any hike, Wild Burro Trail is well marked. You should easily be able to find your way around this trail, or any of the routes it leads to, by following the markings along the way. In all, the simple route is about 3.5 miles, and you should plan for about 1 ½ hours to make the journey. There are several loop hikes that join up with Wild Burro Trail, ranging from 5.1 to 12.0 miles, each of which varies in difficulty and elevation gain. Be sure to read up on specific trails before beginning your trek. It’s always essential to hike with the right gear. Be sure to slather on sunscreen and wear the proper attire. 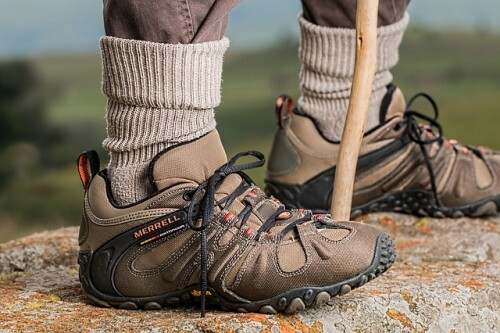 Even the moderate levels of the hike can be difficult if you’re not wearing proper shoes. Time your hike right. Because Arizona sun can get very hot, you’re best to trek the trails in the morning or evening hours when the sun isn’t at full force. No matter what time of day or year you choose to take this hike, be sure to pack ample amounts of water to combat dehydration. Also, since there is such a lovely, scenic view at the top of Wild Burro Trail, you may find it optimal to pack a sack lunch so you can sit down and enjoy the breathtaking landscape at the Apex. Typical high desert wildlife calls the Wild Burro Trail home. Be on the lookout for bob cats and mountain lions, as this is a normal habitat for big cats. Javelina and snakes also call this area their home. In terms of vegetation, you can expect to see cacti and other plants that flourish in the arid climate of Arizona. The Ritz-Carlton Residences, Dove Mountain are located in a premier place for anyone who enjoys outdoor activities. With 45 miles of trails that wander through the Tortolita Mountains and dozens of routes that wind through the expansive neighborhood of The Residences, hiking, biking, and outdoor strolls are simply a part of life. Come see for yourself!